When it comes to carpet burn repair in Louisville, we’ve seen it all. Fixing and repairing carpet burns is another way we help renters keep their deposit. The Carpet Chemist repairs clothing iron burns, hookah and cigarette burns, burns from fireplace embers, and even burns created by dragging heavy furniture across the carpet. Furniture moving companies, Heating and Air companies, and other Louisville businesses trust The Carpet Chemist to repair burned carpet sections, to avoid costly replacement of entire rooms of carpet. We are Louisville’s trusted emergency carpet burn repair team. 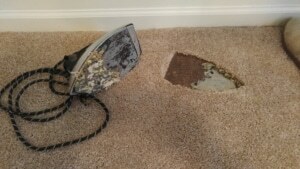 When iron burns happen in carpet, people usually call us frantically, hoping we can repair the damaged carpet somehow. We assure them this is a completely fixable thing, and that we do hundreds of these carpet burn repairs every year. Not all carpet is created equal, and for some cheap types of carpet, it doesn’t take much for an iron shaped burn to appear, when it is left face-down on the carpet. The Carpet Chemist will assess the situation, and ideally use a leftover carpet remnant section as the donor piece for the repair. Many times however, using a leftover carpet remnant isn’t an option, in cases where the customer is an apartment renter for instance. So what we do then is find a closet with a very inconspicuous corner, cut out a section about the same size as the burned carpet, and use that carpet section as our donor piece. After the carpet repair is complete, we will fill in the closet section with a closely matching carpet remnant we keep on our carpet repair vans. Landlords and property managers never really have a problem with this, as it is the same procedure we go through with them, when they call us to repair burned carpet. Repairing small cigarette burns in carpet requires a totally separate arsenal of tools than clothing iron burns in carpet. Our process is very intricate but the results are amazing! We are experts in repairing cigarette burns in carpet, with certified training and skills necessary for a seamless carpet repair, so you can be confident no one will ever notice a carpet burn repair was even made. We’ve got your back. If the carpet burn has penetrated the carpet backing and burned the carpet padding, we carry extra rolls of padding just in case we need to replace small sections. STEP 2. UPLOAD pic of the burned carpet to the UPLOAD ATTACHMENT section below.